Imagine a sunny day, a family gets in a car on their way to the countryside for a weekend getaway. What promises to be a beautiful scenic drive is abruptly interrupted by their environment friendly electric car running out of battery and stopping dead in the middle of the road. Durability has always been one of the biggest issues preventing electric cars from being used by more people. As of now, the longest-lasting electric vehicles running on commercial lithium-ion batteries can run for about 160 kilometers. Higher costs compared to gas-powered vehicles is another key issue. To overcome these challenges, scientists have been seeking solutions in batteries that use lithium, and a raw material with zero cost -- air. The glaring issue of “efficiency” lies at the center of their quest to equip “breathing batteries” into every electric vehicle. “In case of lithium-ion batteries, we can use nearly 100 percent of the power that is charged. It has almost zero energy loss. But lithium-air’s efficiency is less than 60 percent,” said Sun Yang-kook, a professor of energy engineering at Hanyang University in an interview with The Korea Herald. Sun has been studying how to overcome this hurdle, and now believes they have found an answer through a lithium-oxygen battery based on lithium superoxide (LiO2) as its main product. Related research by Sun and an international group of researchers was recently published in the journal Nature. 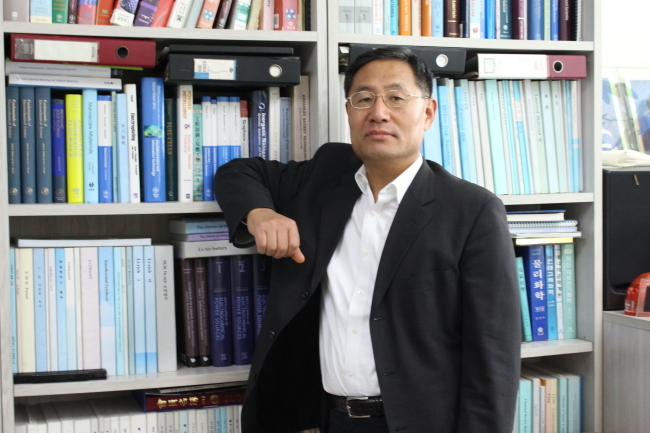 The report was named “A lithium–oxygen battery based on lithium superoxide.” Sun, his fellow Hanyang professor Lee Yun-jung, along with Larry Curtiss and Khalil Amine of Argonne National Laboratory were among those who contributed to the study. Lithium-air batteries have approximately five times as high energy density as lithium-ion and are theoretically capable of lasting much longer. “A simple explanation would show that an electronic vehicle (using lithium-oxygen battery) would run five times the 160 kilometers a lithium-ion-powered one would run,” Sun said. Previous works on lithium-batteries had lithium peroxide (Li2O2) as the main ingridient, which is relatively stable but is not easily decomposed back to oxygen and lithium. As a result, the batteries fail after far fewer charging cycles compared to lithium-ion batteries. In addition, it is a nonconductor and is less efficient. Sun and his colleagues managed to create a lithium-air battery that mainly creates lithium superoxide, a half-metal with higher conductivity than the lithium peroxide. “Because of its unstable nature, lithium peroxide is mainly created (in the process). ... What we did is create a process in which lithium superoxide is produced and then decomposed, raising the potential,” Sun said. This was done by adding the iridium to the mix, reducing the amount of unwanted reaction to the minimum. The iridium reacts to lithium, creating Ir3Li. This shares the same orthorhombic structure as the lithium superoxide, enabling them to pare and maintain stability. Sun explained that by using lithium superoxide, the team was able to raise the energy efficiency to 83-84 percent. This is still far from reaching commercialization stage, which he calculated would need energy efficiency to be at least over 90 percent, but it marks a huge step forward. Sun stressed that there are still obstacles to overcome in the road to commercializing lithium-air batteries. “It is a major breakthrough, but there are still lots of issues including the unwanted reaction within the electrolyte,” he said. “But if we do somehow find ways to solve those problems, this (lithium-air battery) will in fact be a dream battery,” he said.